Rob Zombie is celebrating 20 years of solo foot-stomping, hair-raising, and thrill-seeking with a fully stocked vinyl arsenal of the heaviest rock anthems known to man. To be released March 30 by UMe in a limited edition of 1,000 copies worldwide, each foil-stamp numbered ROB ZOMBIE vinyl box set features 11 Zombie solo albums exclusively on 15 audiophile-quality 180-gram LPs. Available now for preorder only from uDiscoverMusicUS, the lavish box set collects all of Rob Zombie's studio and live solo albums, including several previously out-of-print or previously unreleased on black vinyl, plus the vinyl LP for Zombie's brand new live album "ASTRO-CREEP: 2000 LIVE," which also debuts on CD and digitally on March 30. The vinyl box set also includes all 11 albums as digital audio on an exclusive Creeper Robot USB device and other Rob Zombie-designed and commissioned extras available only in the new collection. Except for "HELLBILLY DELUXE 2," all the albums are also available for individual preorder on standard weight black LPs. Preorder Rob Zombie's "ASTRO-CREEP: 2000 LIVE" on vinyl, CD and digital. A knockout from first glance, the Rob Zombie-designed vinyl box set is a glossy, 15.6-pound superbeast, with an individually hand-painted, 1970s-style Creeper Robot mask displayed behind a transparent plastic window and easily accessible for wearing. Another compartment houses the 11 studio and live albums, including the brand new "ASTRO-CREEP: 2000 LIVE," recorded at Riot Fest Chicago in September 2016, capturing Zombie's first concert performance of White Zombie's final and bestselling album, 1995's "ASTRO-CREEP: 2000," in its entirety. The live album's standard weight vinyl LP will be available outside the box, as well its CD and digital formats, also available now for preorder. All the albums in the box set are making their 180-gram audiophile black vinyl release debuts or are returning to 180-gram black vinyl for the first time since their original release. 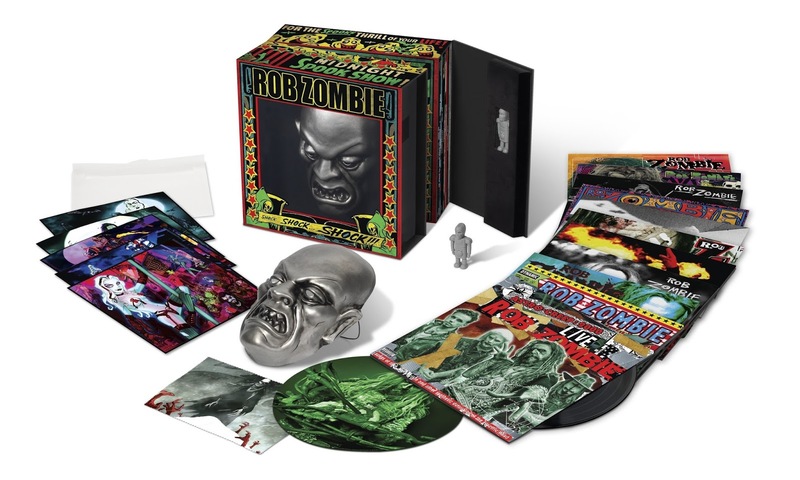 In addition to the Creeper Robot mask, the collection's exclusive bonus items include an eight gigabyte Creeper Robot USB stick with the set's complete audio in 44.1kHz/16-bit uncompressed digital audio files for personal use; five high quality illustration lithographs newly commissioned by Rob Zombie, including one autographed by the Hellbilly himself; a Zombie-designed turntable mat; and a microfiber cleaning cloth for the collection's LPs. "ROB ZOMBIE: ROB ZOMBIE LIMITED EDITION VINYL BOX SET"